The TLS pump is a positive displacement rotary lobe pump designed according to the sanitary requirements. The pump has a rediced size and it is highly efficient and reliable. 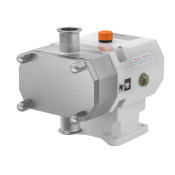 This close-coupled lobe rotor pump is ideal for managing all kinds of fluid, of either low or high viscosity, in the food-processing, dairy and cosmetic industries as well as for filtering and bottling applications. Products containing fragile solids such as junket can be pumped without damage thanks to the specially designed lobes. 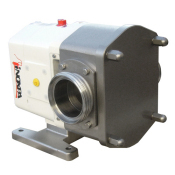 The TLS rotary lobe pump is a monoblock pump that can be adapted to any gear motor with a B5 flange. The pump basically consists of a stainless steel pump housing and cover manufactured by investment casting, two tri-lobe rotors with a sanitary design attachment. Moreover, the pump is provided with height adjustable stainless steel legs of hygienic design. 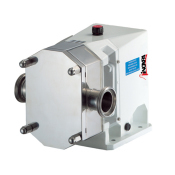 The rotary lobe pump is provided with a C/SiC/EPDM external single mechanical seal. The seal is balanced and has a sanitary design. If an application requires it, other seal materials can be used. Helical gear unit with B5 flange in compliance with the IEC standards and triphasic induction motor 4 poles=1500/1750 rpm, efficiency class according to EC regulation, IP 55 protection and F-class insulation. Mechanical seal options: SiC/SiC, TuC/SiC. 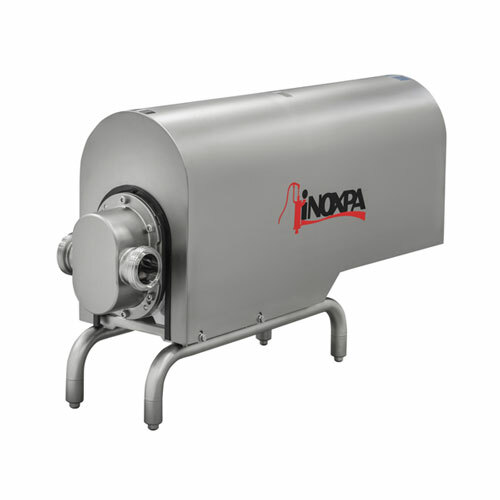 Stainless steel shroud can be mounted without disassembling the pump. Other drive types and protection classes. Polyester or stainless steel control box. Summary La bomba TLS es una bomba lobular rotativa de desplazamiento positivo y diseño sanitario que ofrece altas prestaciones y máxima fiabilidad con unas dimensiones reducidas. Summary The TLS pump is a positive displacement lobular rotating pump of a sanitary design providing high performance and maximum reliability with a reduced size. Summary La pompe TLS est une pompe lobulaire rotative à déplacement positif et de conception sanitaire permettant des hautes prestations et une extrême fiabilité avec des dimensions réduites. Summary Die TLS Pumpe ist eine volumetrische Drehkolbenpumpe, mit hohen Leistungen und Zuverlässigkeit, und mit geringeren Abmessungen. Summary La pompa TLS è una pompa a lobi rotativa di spostamento positivo e disegno sanitarioche offre alte prestazioni e massima affidabilità con delle dimensioni ridotte. Summary TLS pumpen er en loberotor pumpe med positiv fortrængning og et sanitært designvelegnet til anvendelse i mejerier, føde- og drikkevare industri samt farmaceutisk og kosmetisk industri. Summary Кулачковый моноблочный насос TLS представляет собой объёмный насос санитарного исполнения. Summary Las bombas lobulares TLS de INOXPA forman parte de nuestra extensa gama de bombas rotativas de desplazamiento positivo para líquidos viscosos. Summary The TLS lobes pumps by INOXPA are part of our wide range of positive displacement rotary pumps for viscous liquids. Summary Les pompes à lobes TLS d'INOXPA font partie de notre vaste gamme de pompes rotatives à déplacement positif pour liquides visqueux.